Or maybe not. Either way, I like doing themed edits because PROPS and RIBBON and STICKERS. I’m not really a big V day person, but I do appreciate the chocolate, roses and the ‘ironic’ cards. Ok, maybe I do like it a bit? I do find big romantic gestures a bit cringe, but Chris and I are going to see the charlie & the chocolate factory musical so there’s that. 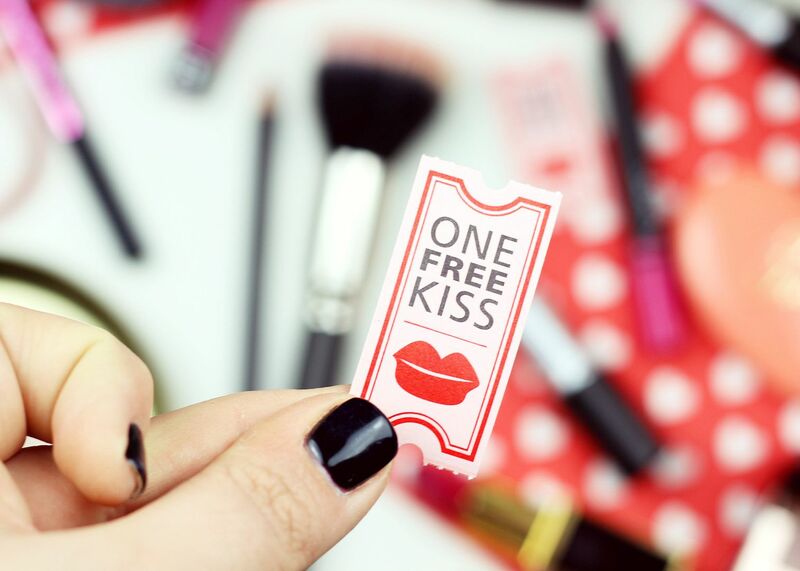 Whatever your plans for gal/valentines day, I think that everyone needs these free kiss stickers. Except don’t give them out at work, because (unless your colleagues are v different to mine) your desk mate might not *get* your humour. Hmm. So with Valentine’s day, I’m thinking pink and red. Yes, I know, so groundbreaking… but so pretty. Of pink lips, there are many. 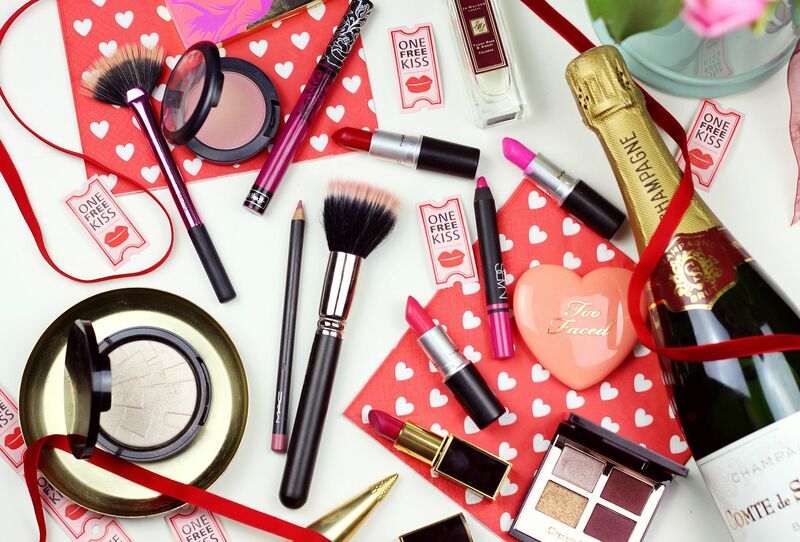 From baby pink to fuchsia, if there was ever a time to channel your inner Penelope Pitstop… it’s Valentine’s day. Some of my favourites include NARS Yu, MAC Candy Yum Yum, MAC Impassioned, KVD Bauhau5 and Tom Ford Plum Lush. If you’re more into softer, subtler pinks then check out this post on perfectly pink lipsticks featuring shades I wear all the time. Of course, red lips are always good – can’t beat Ruby Woo, can you? Nope. Master of gorgeous fragrances, Jo Malone has so many good romantic scents. My favourite is the limited edition tudor rose, which I am savouring, but they also have a classic red roses scent. As an aside, I am actually planning to book in for a wedding fragrance consultation – so excited! While we’re going for the whole pink lip thing, might as well go the whole way and embrace the girly look. My old favourite MAC Dame blush always comes out when I fancy a really pretty pink flush on the cheeks, and then add some of the dreamy Anastasia starlight highlight for an ethereal, angelic look? Mmhmm. What are your V day plans? If you liked this post you might like this post on desert island beauty or this post on trying makeup geek.